Neil Young in the street of Glasgow outside a subway station back in April, 1976 singing the "Old Laughing Lady" on his banjo. The impromptu session took place just prior to Neil's appearance at the the Apollo Theater. 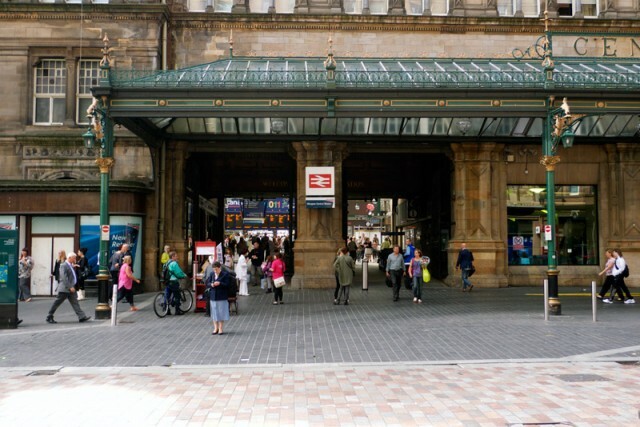 The photo above is where Neil Young was busking 35 years ago, just behind the guy with the bicycle. dave from vancouver wa. says....simply beautiful!!! ....... how refreshing to look @ that crowd in the terminal, and not see one backward turned baseball cap ! Whats the source of the film? Scott Young was mentioning it in "Neil and me". So is it part of the Archives Vol.II? But what about Neil and Frank Zappa (he lived in Laurel Canyon for some years as well) - did both ever met or talk about the other? I wear my hat backwards! Also, we've never heard of any Frank & Neil intersections. But they would certainly be interesting. Love the shots of the old laughing lady in the cap too. Magic, thanks for this Thrasher. wow - if this is a taste of what Volume II is going to include, then it will be way better than I've imagined. Magic indeed. Does anyone know if that's the same 6 string banjo he played on 'Love Art Blues' during the 2007 Chrome Dreams II tour? Sorry it was 'Mellow my Mind' that I'm thinking of from 2007 that he played with a 6 string banjo. Same one?? @Jonathan - not sure on banjo. Good question. 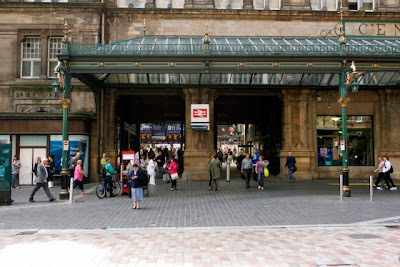 The venue is actually Glasgow Central railway station as opposed to the subway. "Hallo" to the Neil fan in Malte. I'm not sure about a personal connection or friendship, but I do recall when Frank Zappa was inducted in the R&R HOF, Neil was the absolute very first person to be on his feet, giving the late, great Mr. Zappa a standing O. He seemed very moved and I can still remember watching this and the look on his face. Maybe others might know more on this. And I have no idea which direction Frank's baseball cap pointed....but I'm sure it was cool!